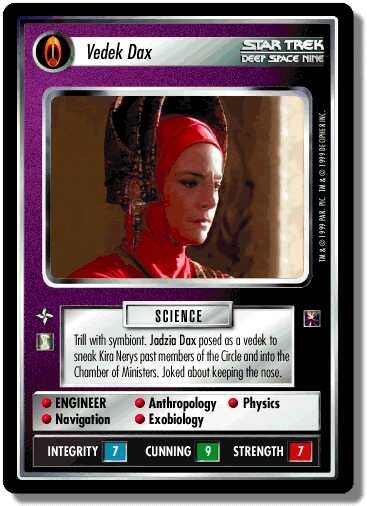 Characteristics: "Reshape the Quadrant"-related cards, affiliation, Orb icon , Vedek, "The Circle"-related personnel, "Trill with symbiont"-related personnel, Trill species. There are 43 entries for Vedek Dax (ST1E 0 P 74) at the Tradeplace (71 haves and 6 wants). Click here to see all trade list entries for this Promotion card! Also see here for all trade lists with any card fom "Second Anthology".